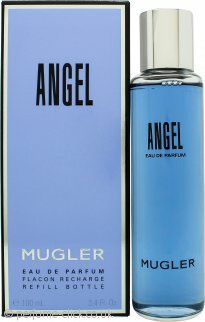 Angel was the first scent released by Mugler and has continued to rank among his most successful fragrances, winning a FiFi Award Hall of Fame in 2007. It has an excellent longevity with a unique composition of sweet ingredients that makes it extremely recognizable. It was one of the first fragrances to use what has become known as "gourmet" notes - ingredients inspired by food and sweets. Due to its exceptional success in the last two decades, Angel was followed by many special editions, including “Angel Aqua Chic”, “Angel Muse”, and “Angel Precious Star” - released for the occasion of the scent’s 20th anniversary.